Quick & Simple Breakfast Sandwich with only 315 calories! Ready in less than 15 minutes with minimal clean up! Preheat broiler to high. Line a baking sheet with foil. Broil bacon/bagel until crispy. Watch the bagel, it will cook fast. While bacon is cooking separate the egg whites into a small bowl and lightly beat with a fork. Pour half of the eggs into a microwave egg cooker and cook for about 1 minute (my favorite is by Nordic Ware – http://amzn.com/B001B2MRSE). Remove egg patty and repeat with the rest of the eggs. 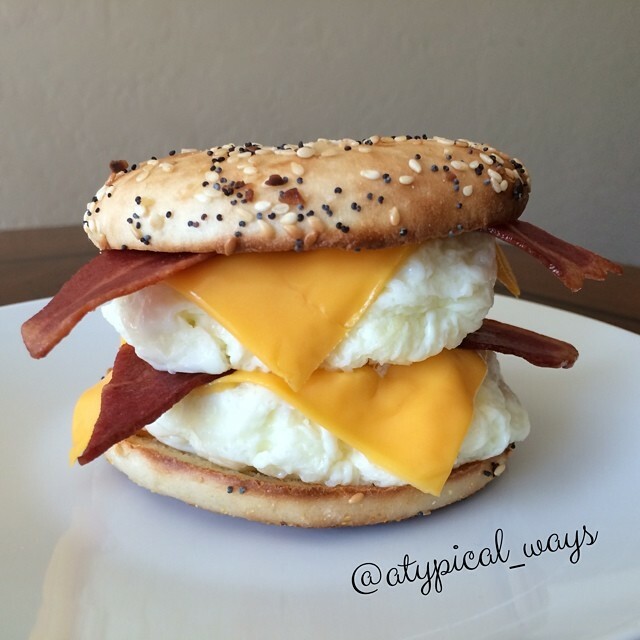 Layer bagel with egg, cheese & bacon!